And I always say - while you have your stamps and inks out - go ahead and create a coordinating envelope to go with it! 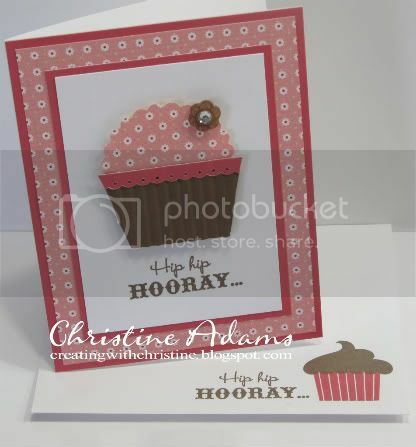 Here, I used the Fanfare Workshop on the Go stamp set for the cupcake image. 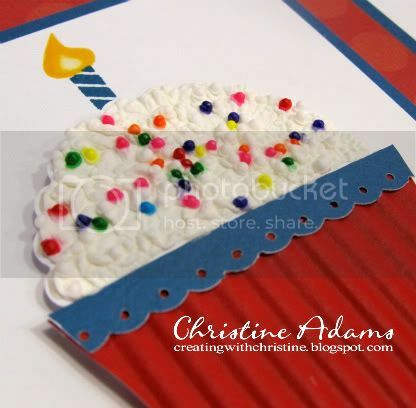 This project teaches some very cool techniques including using a paper crimper for the cupcake "papers" and our very fun 2" scallop punch for the cupcake top! 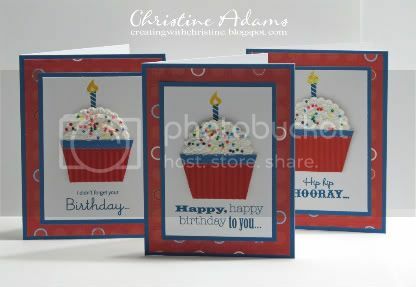 It also includes one of my very favorite new stamp sets - Card Chatter Birthday! 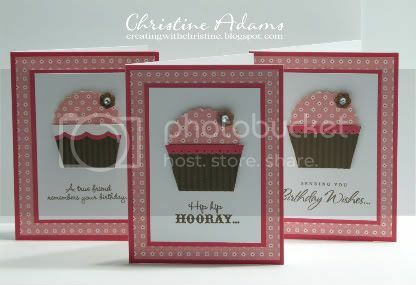 This stamp set includes coordinating inside/outside birthday greetings! As an alternative, I wanted to create another version that wasn't so feminine - more multi-purpose. In this version I used white cardstock for the cupcake top - then topped it with Liquid Applique and REAL cupcake sprinkles! I'll post a video tutorial of this technique next so you can see how fun and easy this is! Contact if you would like to join me for this month's project or if you would like to order a kit by mail - complete with pre-cut, pre-stamped papers and step-by-step instructions! The kit is $5 for 3 cards/envelopes (pink or red/blue) or FREE with an order of $25 or more. Get TWO sets for FREE with an order of $50 or more, and so on. Additional sets may be purchased for $5 each.